Centipede is a new idea, a new experience in game play that challenges skill and concentration. It’s easy to learn, but the tension builds relentlessly as the game progresses. The player must destroy the centipede as it moves faster and faster through a colorful mushroom field, as well as protect himself from a deadly Flea and ferocious Spider. A poisonous Scorpion further threatens the player and makes a good target as it sails across the playfield, poisoning mushrooms that it touches. The excitement begins as soon as the player’s gun is activated. The first centipede begins its treacherous path through the mushroom field. The Track-Ball controlled “gun” can be positioned up or down and side-to-side for maximum firing versatility. Players must destroy mushrooms to get a clean shot at the centipede and other targets. When they centipede runs into a mushroom, it turns and moves down another row. If the player hits one of the centipede segments, the centipede splits into two separate bodies and keeps coming. If the centipede or any portion of it, reaches the bottom of the screen without being destroyed, it turns back and heads up the screen. As soon as any non-poisoned centipede makes it through the mushroom field to the bottom of the screen, new centipede heads will enter. 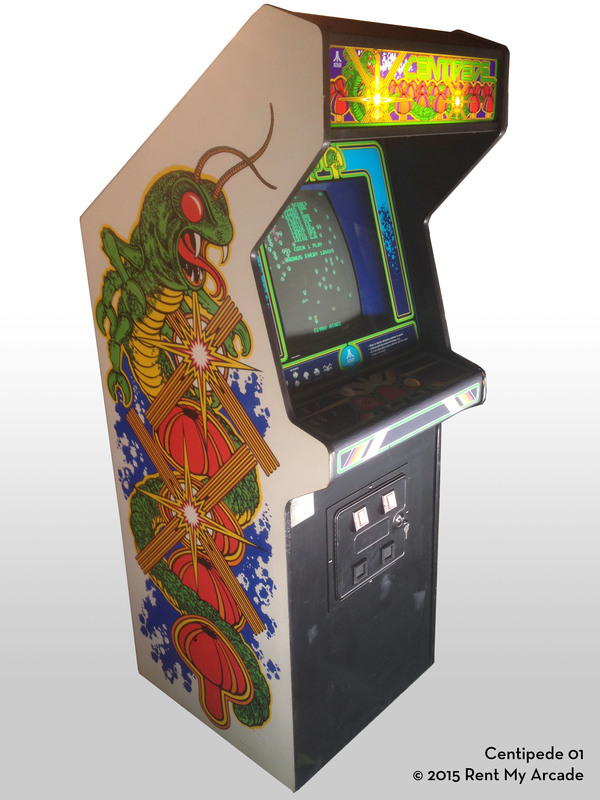 As the game progresses, these heads will appear more frequently When an entire centipede is destroyed, the screen changes color and a new centipede starts at the top. The centipedes will alternately move fast or slow. To add increasing challenge, a spider moves across the screen in a random up and down pattern. The spider can destroy the player as well as any mushroom it passes over. The spider crawls very quickly later in the game. A flea drops down the screen, bombarding the player and leaving mushrooms in his wake. The flea appears if there are fewer than five mushrooms on the bottom of the screen. As the player’s score increases, the flea appears ore often. A deadly scorpion “poisons” any mushroom it touches. The centipede is also “poisoned” when it contacts a poison mushroom. As a result, it immediately turns and heads down to the bottom of the screen. The poisoned centipede can only be stopped before it reaches the bottom by shooting its head. H: 71", W: 26.75", D: 25.25"